Folks, it seems that the year 2019 has been selected for celebrating the LIGO discoveries around the world with a vengeance. They intend to drown out the dissident voices with this tremendous onslaught. In January, Ligonauts from around the world will gather in a five-star luxury resort called Dukes Retreat in Maharastra (“Experience a New Dimension of Comfort and Class”). Stonewall Reitze will be there to give assurances that all is well with LIGO. They will celebrate “The Era of Ligo India”. It is a little disconcerting terminology, considering that all there is of LIGO India is a concrete marker post out in the boonies. Three years after the Government gave resounding approval to LIGO , there is no sign of any caterpillars or bulldozers on the ground. 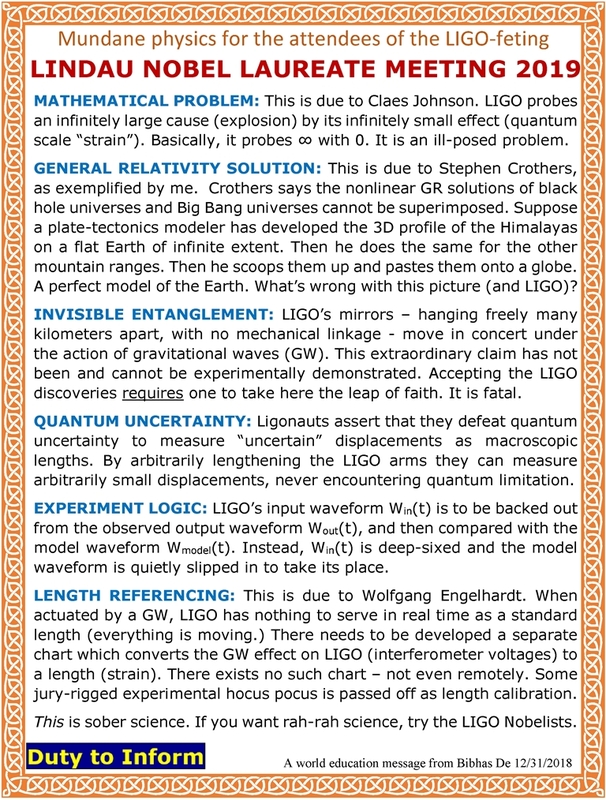 There is only happy talk about LIGO India. Seasons turn, shrubs grow, shrubs dry – that’s about all that is happening in LIGO India’s chosen site. But I hasten to add that the Indian Government, to its credit, is not funding this lifestyle of the celebrity academics. A private charitable organization called Tata Trust will happily pick up the tab at the five-star luxury resort. Starmus V festival will be held at the end of June in Zurich. It is a ticket event. They promise to put 12 Nobel Laureates on their stage for you. Of these 6 are cosmology’s scam discoverers. Rock stars, Nobelists and astronauts will regale the audience. Ol’ Kippy Boy will discuss the universe. There will also be awarded the Stephen Hawking Medal for science communication. Last year’s medalist was Neil deGrasse Tyson! This year’s winner will have his photo right next to Tyson’s. What an honor! The 69th Lindau Nobel Laureate Meeting will take place in early July. Its theme is physics, and the organizers have deliberately chosen to emphasize cosmology (meaning essentially LIGO). 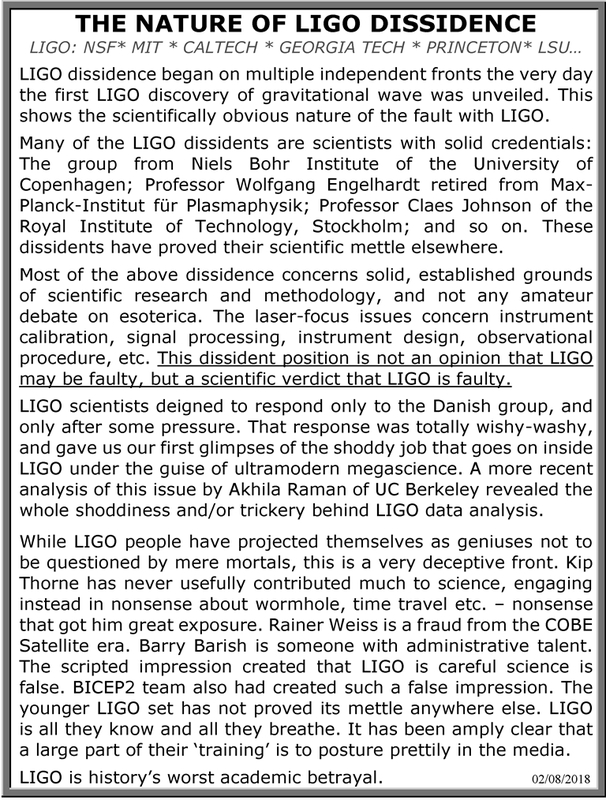 The ten cosmology Nobelists (Penzias, Wilson, Mather, Smoot, Perlmutter, Schmidt, Riess, Thorne, Weiss, Barish) all got the Prize for scam/fraud discoveries. Many of them will be in Lindau to inspire select young talent from around the world. In fact, the ones that will attend Starmus will just have enough time to hop over from Zurich to Lindau. The Lindau Nobel Laureate Meetings have the approval of the Nobel Foundation. If you still do not see that your scientific civilization is being systematically and rapidly dismantled by powerful organized forces, the year 2019 will be the year the pod trucks will roll into your town and secretly place a pod in your cellar. All you have to do is fall asleep. What is going on in the world is beyond belief. Why responsible people are not acting is beyond imagination. Read about the past Lindau Nobel physics meetings. Click on the following image to download the free pdf eBook. This entry was posted on December 31, 2018 at 11:14 am and is filed under LIGO Discovery, LIGO India, Uncategorized. You can follow any responses to this entry through the RSS 2.0 feed. Both comments and pings are currently closed.